Kim Kardashian is facing backlash from her fans over a photo she posted of a gun just weeks after pledging to stop gun violence. The reality star posted a photo to Instagram last weekend of a diamond-encrusted gun. She quickly deleted the photo, but British tabloid The Sun and other outlets picked up the photo.
" @KimKardashian You have too much influence to be this blind and ignorant. Innocent children & people still die even if the gun is pretty," one of her followers tweeted back at her.
" @kimkardashian seriously. When everyone is debating gun control, this is what you post - as if it's just a fun accessory?" another tweeted. Kardashian's publicist did not immediately respond to questions about the photo. But some of her fans came to her defense. "Kim Kardashian posted a pic of a gun on Instagram & now everyone is all pissed off. I forgot the 2nd amendment didn't count for celebs," one fan tweeted. On Jan. 14, one month after the horrific elementary school shooting in Newtown, Conn., Kardashian vowed to help reduce gun violence. "Today, people in Newtown are making the #sandyhookpromise to reduce gun violence. Sign the pledge with me at http://www.sandyhookpromise.org ," she tweeted. But Kardashian has displayed her appreciation for using before. In November, she shared a photo on Instagram of her shooting a gun with the caption "Bang bang." 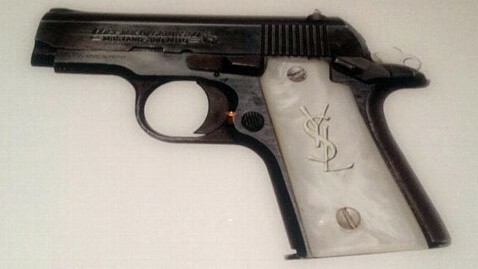 Last June, she posted a photo of a gun designed by YSL with the same caption.